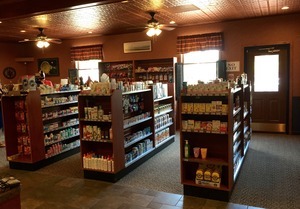 Lewisburg Pharmacy, located at 50 North 2nd Street in Lewisburg, opened Aug. 4. Owned by Brad and Jeannette Gill, and their family, this independent pharmacy is a dream come true for the couple. Both Brad and Jeannette have their Doctorates in Pharmacy and have been practicing pharmacists for 15 years. Jeannette is a Sunbury native and Brad is from Clearfield. The pharmacy is open Monday through Friday 8 a.m.-6 p.m. and Saturday 9 a.m.-1 p.m. We stopped by on opening day to get to know the Gills. Susquehanna Life Magazine: Why did you open this pharmacy? Jeannette: Family is very important to us and we felt a need to do something for our family, something that would eventually give us more time with each other. We didn’t want to be restricted by working longer hours and we also felt the need here in the community for more one-on-one service, versus working with a big corporation. SLM: Why did you choose this location? J: We’ve always liked downtown Lewisburg. SLM: What were your aspirations for this pharmacy? J: We wanted it be family-friendly, serving everyone, from children to the elderly. We want to reach out to the community and make it a place that people can come, know us, feel comfortable and be able to ask us questions. We want to make sure we have things that are convenient for them. SLM: What are your professional goals? J: We would like to do a thing called blister packing, for people who may need a little bit of help with their multiple medications; sometimes it can get confusing. We are going to package their medications according to different time slots to make it easier for them. We also are going to offer free deliveries so when you are not feeling well or you can’t get to the pharmacy, we can get to you. Down the line we would like to offer educational programs using educational games. People will come in and we will sit, offer them coffee, play a game and ask questions [designed to educate]. SLM: What makes this place special? J: I like to think that it is special because it is family run and our kids are very excited about it, as well. When you come into an atmosphere that is positive you’re going to walk away feeling good about the place. We hope that we make a lot of friends and get to know the community better. SLM: When did you start planning for this? J: We started to think about it back in December [of last year] after we talked to a couple of friends who opened independent pharmacies and they loved it. They love the interaction and the customer service. So we started to think about it as well. My husband and I are both pharmacists and we thought it was a good move for us. So we started in December, and it took several months. It was very time consuming and took a lot of energy but we are glad to finally be able to open. SLM: What can people expect when they first walk into your pharmacy? J: They can expect to be greeted with a smile and a hello. We are hoping that we get to know everybody very well and they can come in and share their family with us as we will share our family with them. We want a friendly atmosphere. SLM: What do you feel will be the most rewarding part of running this business? J: I think that it is going to be the people. When you make somebody happy, and when they smile, it makes you feel good, especially when you get a compliment and make new friends. We’ve already met some great people just in the last two days alone. SLM: Is there anything we haven’t asked that you think is important? J: We are just excited to be here in the downtown Lewisburg location and we look forward to serving everybody and helping them with all of their medication needs.